Can you design business models? A review of "Seizing the White Space." 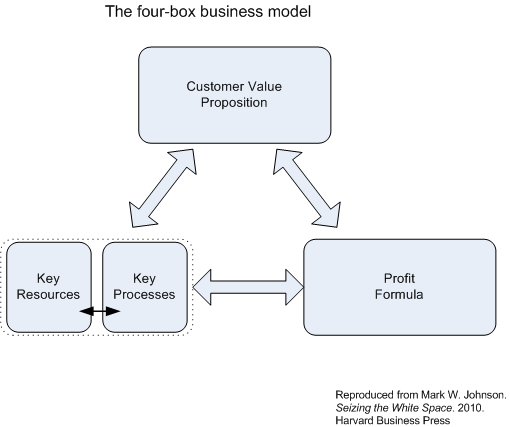 Seizing the White Space: Business Model Innovation for Growth and Renewal, Johnson, Mark W.
What is a "business model" and can you create a new one in a systematic and disciplined way? That’s the question that Mark Johnson, chairman of the consulting firm Innosight, sets for himself in Seizing the White Space. The term entered the popular business lexicon during the dotcom boom in the late 1990s. There wasn’t any particular definition behind the term at the outset. Effectively, it was shorthand for the answer to question zero about any business – "How are we planning to make money?" Before the dotcom boom, nine times out of ten, the answer was "we’ll copy what Company X is doing and execute better than they do." During the boom, the answer seemed to be "we have absolutely no idea, but it’s going to be great." Now we recognize that both of those answers are weak and that we need some theory to design answers that are likely to be successful. Over the last decade and a half, there’s been a steady stream of excellent thought and research focuses on building that theory. One of the major tributaries in that stream has been the work of Clay Christensen on disruptive innovation. Christensen and his colleagues, including Johnson, have been engaged in a multi-year action research program working out the details and practical implications of the theory of disruptive innovation. Seizing the White Space is the latest installment in this effort and is best understood if you’ve already invested in understanding what has come before. Why do organizations need to worry about white space? Even with success at exploiting their current business model and serving existing customers, organizations reach a point where they can’t meet their growth goals. Many an ill-considered acquisition has been pursued to plug this growth gap. Haphazard efforts at innovations to create new products or services or enter new markets get their share of the action. Johnson combines an examination of white space and business models in an effort to bring some more order and discipline to the challenge of filling those growth gaps. One implication of this approach is that the primary audience for his advice is existing organizations with existing successful business models. He is less interested in how disruptive innovation processes apply in start up situations. Johnson expands the next level of detail for each of these elements. Most of that is straightforward. More importantly, this model places its emphasis on the importance of balancing each of these elements against the others. In the middle third of the book, Johnson takes a deeper look at white space, dividing it into white space within, beyond, and between which correspond to transforming existing markets, creating new markets, and dealing with industry discontinuity. It’s a bit clever for my tastes, but it does provide Johnson with the opportunity to examine a series of illuminating cases including Dow Corning’s Xiameter, Hilti’s tool management and leasing program, Hindustan Unilever’s Shakti Initiative, and Better Place’s attempt to reconceptualize electric vehicles. While the organization of the stories is a bit too clever, it does serve a useful purpose. It takes a potentially skeptical reader from the familiar to the unfamiliar as they wrap their heads around Johnson’s ideas. With a basic model and a collection of concrete examples in hand, the last third of the book lays out an approach to making business model innovation a repeatable process. This process starts from what has evolved into a core element of Christensen’s theories – the notion of "jobs to be done." This is an update on Ted Levitt’s old marketing saw that a customer isn’t in the store to buy a drill but to make a hole. The problem is that most established marketers forget Levitt’s point shortly after they leave business school and get wrapped up instead in pushing the products and services that already exist. "Jobs to be done" is an effort to persuade organizations to go back to the necessary open-ended research about customer behavior and needs that leads to deep insight about potential new products and services. With insight into potential jobs to be done, Johnson’s four-box model provides the structure to design a business model to accomplish the job to be done. In his exposition, he works his way through each of the four boxes, offering up suggestions and examples at each point. With a potentially viable design in hand, he shifts to considerations of implementation and, here, emphasizes that the early stages of implementation need to focus on testing, tuning, and revising the assumptions built into the prospective business model. Johnson clearly understands that creating a new business model is a design effort not an execution effort. Seizing the White Space puts shape and structure underneath this design process. All books represent compromises. The compromise that Johnson has made is to make this design process appear more linear and structured than it can ever be in practice. He knows that it isn’t in his emphasis on the need to balance the elements of a business model and to learn during the early stages of implementation. There’s a reason that the arrows in his four-box model flow both ways. I’m not sure every reader will pick up on that nuance. He also clearly points out the role of learning from failures as well as successes during implementation. But the demands of fitting the story into a finite space again undercut this central lesson. The models here will go a long way toward making business model design more manageable, but they can’t make it neat and orderly. This review is part of a "blogger book tour" that Renee Hopkins, editor of Strategy and Innovation and Innoblog, arranged. If you’re interested in digging deeper into the work of Clay Christensen and his posse, here are some previous posts where I’ve pulled together some reviews and pointers. I hope you find them helpful. Constraints and innovation is there a silver lining?